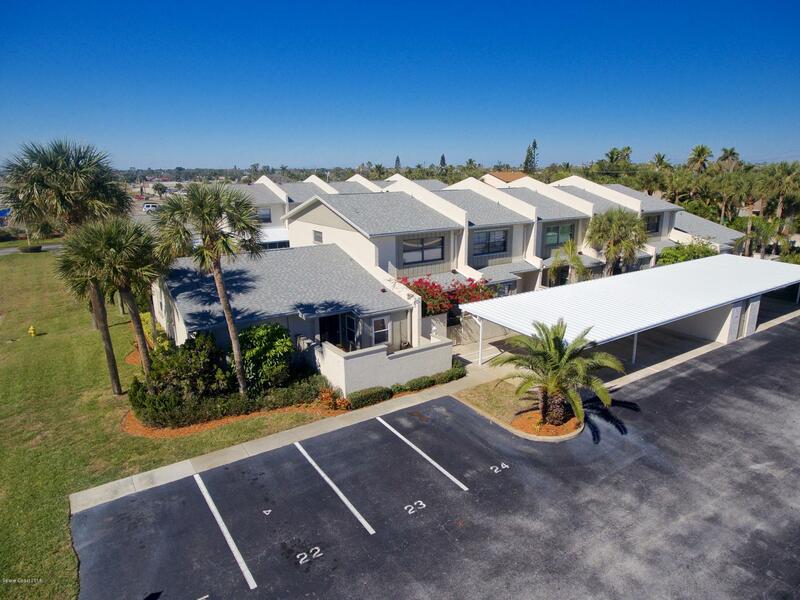 Minutes to the beach, between the ocean and the river sits this charming affordable townhome community. One story residence is perfect for a full-time home or a great vacation getaway. Featuring tile floors throughout, whimsical wallpaper in the kitchen and bath, a huge living/dining room area & a substantial screened-in porch. Situated on a grassy lawn, this end unit is surrounded by meticulous landscaping and towering palm trees all maintained by the association. The front entry is a private courtyard w/ lush foliage where one could grow fresh herbs or fill w/ flowering plants. Truly this residence feels like a single-family home but w/ the maintenance free lifestyle of townhome living. New roof, newer windows & hurricane shutters are present. Owner enjoys 2 parking spaces (1 covered).